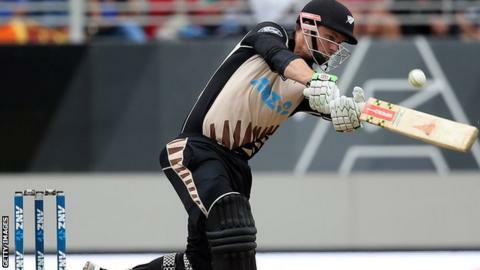 Colin Munro hit the second-fastest Twenty20 international half-century, off only 14 balls, as New Zealand beat Sri Lanka in their final tour match. Munro's 50 not out, which included seven sixes, came in two more balls than Yuvraj Singh took against England in the World Twenty20 in 2007. Team-mate Martin Guptill had set a new Black Caps record earlier in the match with a 19-ball 50 on his way to 63. Sri Lanka, who posted 142-8 in their innings, lost by nine wickets. "Guppy's had a very good record this summer and to beat that record was very pleasing," said Munro, who set a new record for the number of sixes in a first-class innings with 23 in a score of 281 for Auckland in March. Angelo Mathews' career-best 81 not out was the one highlight for the tourists, who depart having lost both Tests, a one-day series 3-1 and the Twenty20 series 2-0.